Blink and you would have missed it. During February 2018 one of the many petitions challenging the 2017 national election results was dismissed. 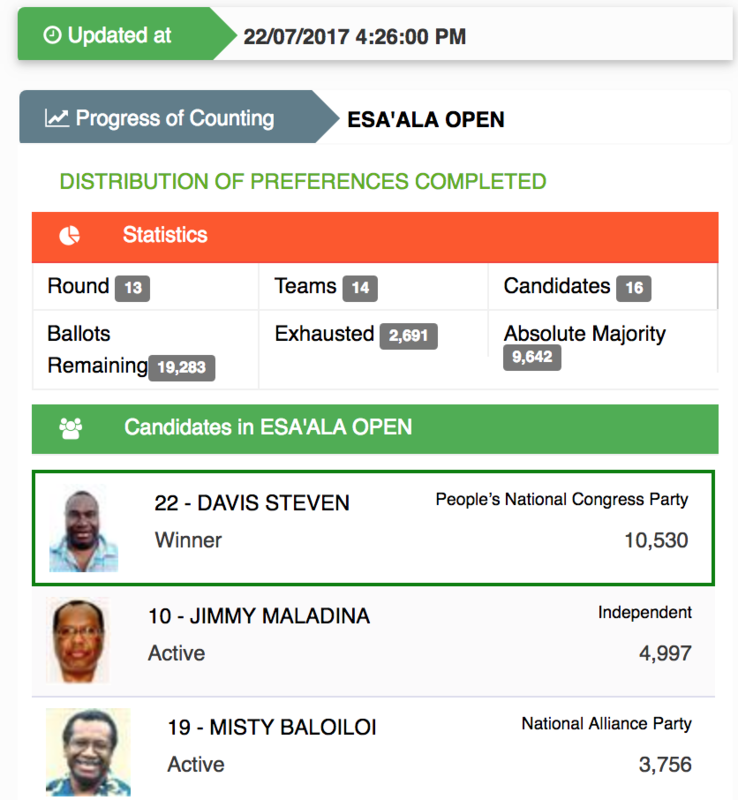 It was alleged by the unsuccessful candidate Glenn Tobewa, that Minister for Justice and Attorney-General, Davis Steven MP, won the Esa’ala Open seat using bribery. The first question that springs to mind is why would two prominent brothers contest the same electorate, and potentially split their vote, in effect, delivering the win to a candidate outside the family. But here is where things get even more interesting. It was claimed in the National Court that Jimmy Maladina was funding and supporting a rival for the seat, Mr Glenn Tobewa. The Judge’s curiosity over the relationship between Glenn Tobewa and Jimmy Maladina was aroused when an Australian Barrister from QLD, Levente Jurth, fronted the case for Glenn Tobewa. Jurth is associated with such high profile clients as Eremas Wartoto, who have much deeper pockets than Mr Tobewa. Judge Higgins observed, this raised ‘the question of the funding of the proceedings given that Mr Tobewa was apparently of limited means’. Who was Mr Tobewa’s “angel” investor? All signs point, again, to his apparent political rival in the Esa’ala Open seat, Jimmy Maladina. Maladina it appeared had paid the airfares of two key witnesses in the case, Mr Polana Lepani and Mr Joe Bentily Bwan. Under cross-examination Mr Bwan also alleged that ‘Mr Maladina had funded Mr Toweba’s campaign’. This led Judge Higgins to conclude that ‘if it is true [it] leads me to believe that the proceedings are really pursued by him [Jimmy Maladina] through the agency of Mr Tobewa’. In short, this case presents eye-witness testimony which suggests that Jimmy Maladina paid considerable money to support the campaign of a political rival. And then Maladina apparently bankrolled litigation against the successful candidate, using the same rival candidate as a proxy to pursue this legal action. It would seem Jimmy Maladina potentially had a lot to gain from a successful petition. If Steven was struck out as a candidate, Maladina would have been next in line for the seat. And presumably given his close relationship with the Prime Minister, a top Cabinet position was almost guaranteed. The question is why would Maladina fund the campaign of a rival? Was this an attempt to split the vote of Davis Steven? And why did Maladina then allegedly hide behind Tobewa in launching a petition? Why did he not lodge the petition himself? And why would Maladina seek to depose an MP in the Prime Minister’s Party, given that Maladina is said to be O’Neill’s closest adviser? Finally, why would the prominent Maladina brothers split their vote? THE JIMMY MALADINA SCANDAL YOU DIDN’T SEE!